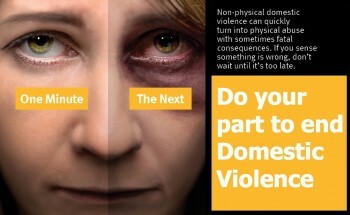 October is National Domestic Violence Awareness Month. Domestic Violence Awareness Month (DVAM) evolved from the “Day of Unity” held in October 1981 and conceived by the National Coalition Against Domestic Violence. The intent was to connect advocates across the nation who were working to end violence against women and their children. Make a donation to NNEDV in honor of the people in your life who have been impacted by domestic violence. Follow us on Facebook, Twitter, Pinterest, Instagram, and Google+ to view and share our #31n31 for the month of October. Each day, NNEDV will be sharing a different survivor’s story. Some are uplifting, some are heartbreaking; all are true and reflect the broad spectrum of experiences that survivors across the country face every single day. Follow along using #31n31. Wear purple — the color of Domestic Violence Awareness Month — during the month of October and use this as a way to tell others why ending domestic violence is important to you. Join our national #PurpleThursday thunderclap on October 22! Participate in 2015’s Week of Action October 19-23, 2015! Change your social media profile and cover photos to show that you stand with NNEDV as we remember those who have lost their lives and celebrate those who have survived. Join the network behind the Network and become a member of NNEDV! For the first time ever,we have opened our membership to individuals who support our work. When you become a member of NNEDV, you add your voice to the chorus of others speaking out against domestic violence. Join NNEDV’s book club, Reader with a Cause, on Goodreads! Many of today’s most popular books raise issues that are connected to domestic violence, sexual assault, or stalking — creating the perfect opportunity to discus the importance of these issues with our friends, families, and coworkers. Join us as we read and discuss equality, empowerment, and violence against women as it appears in contemporary literature.